""Designs of Duty"" by Beth Heldebrandt, Brandi Gard et al. “Designs of Duty,” an exhibit featuring East Central Illinois veterans and their service-related tattoos, is now on display at Booth Library on the campus of Eastern Illinois University. The exhibit will continue through May 11, 2018. “Designs of Duty” tells the stories of seven military veterans who served our country over a 45-year period throughout Asia and Europe. Veterans featured in the exhibit are Eric Hiltner and Wilson Reynolds of Charleston, Ken Fernandes of Newman, Random Clavin of Nokomis, Adam Griffy of Olney, Shane Wright of Shelbyville and Lyle Gordon of Towanda. 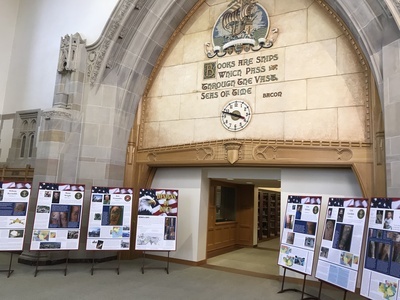 Related exhibits on display include military flags; “Symbols of Service,” featuring University of Illinois student veterans; aircraft nose art from World War II to today; and Vietnam War helmet graffiti.